Michael and James - Comic Con 2013. . Wallpaper and background images in the James McAvoy and Michael Fassbender club tagged: photo x-men days of future past sdcc panel james mcavoy michael fassbender 2013. 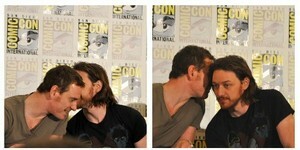 This James McAvoy and Michael Fassbender photo might contain समाचार पत्र, कागज, पत्रिका, अखबार, खपरैल, अख़बार, चीर, and पत्र.